The basics to rocking your b2b sales process. Long days, late nights. A full calendar, a hot phone and a packed inbox. Coffee is your best friend and business non-stop. Sounds like the life of a successful entrepreneur, right? And yet, midst that mountain of papers, sticky notes and emails, you feel an itch. Sales are being made, but they feel more like an accident than a success. This isn’t working. I used to just let my thoughts and ideas float, not bothering with structure and organisation. To-do lists and diaries were for suckers. As a student that meant missing chapters to study. As an entrepreneur it means missing deals and revenues. And while nobody likes bad grades, missing out on sales is worse. It’s dangerous for the survival of your business. Especially if you’re in the early stages. What you need is a system. Something to bring order to the chaos that is your sales process. Something to keep track of your leads, so no deals fall through the cracks anymore. What you need, my friend, is a sales pipeline. We’ll show you why you need one, how to set up one up and what you can do to have it run as smoothly as possible. If you want to excel at something, you first need to get the basics right. The basics of b2b selling are pretty straightforward. Someone is looking to improve his/her life and you’re trying to help them see why your product or service is the best one for the job. Simple enough. But humans are complicated creatures. Decision-making is not a linear process and external factors — like competitors — may come into play. As a sales person it’s your job to guide your prospect through the complexities that come with decision-making, straight to your solution. A sales pipeline is a snapshot of where leads are in your sales process. It’s a visual, organised way to keep track of your potential buyers as they move through the different stages. Thinking of your sales process as a pipeline forces you to streamline your efforts into a repeatable and measurable process with clearly defined steps. It creates a shared understanding that will make your sales more actionable and scaleable. The goal is to take your sales lead from stage to stage, all the way up to the definitive yes. If you fail, the deal is lost or can be put in the fridge to retarget later. The thing is that in sales you can’t control results. What you can control, are activities. Only when your whole team has a shared understanding of what your sales process should be, you’ll be able to optimise those activities and, in turn, improve results. In order to improve, you first need to know what your problems are. Where is it that most deals go bad? What stage is taking the longest? How about stage-over-stage conversion? How many deals do I need to add to my pipeline to reach my goals? The sales pipeline will help you find out where you fail. Next, you’ll be able to turn those failures into best practices. The first time someone appears on your radar. He or she may be interested in your solution and you suspect they might be a good fit. Leads may just come to you, for example because they filled out a form on your website. Or you look for them, in places like conferences, social media or just ‘the Internet’. This is actually a pre-pipeline stage. You need to first find out if they can be an actual prospect for your business before they become a sales opportunity. The first time you reach out and have actual contact. This will likely happen by email or call. Your goal is to verify the lead’s interest in your solution. If yes, you put them in the pipeline. If you find a lead from a positive reaction to a cold email or call, you can immediately put the lead in this stage. This is where you determine whether the lead is a good fit for your business as a customer. Are they within your target market? Do they have a real need for your solution? Do they have a budget and a clear timeline to buy in? Are you talking to the right people in the company? You’ll have to determine if you think a deal can be closed within the usual length of your sales process or not. This often involves a meeting and/or a series of calls. You’ll look for a match between your solution and your lead’s specific challenges. Don’t lose any time if there’s no match: just close the sales opportunity as lost. By now, you’ve built enough momentum to make a formal offer. It’s now up to the lead to either buy or refuse. The moment of truth. Time to get a signature on that bottom line… or not. A sales pipeline is like an arcade game. As a player you have to get your lead from stage to stage. You only win if you can complete all 5 stages. One mistake on the way and it’s game over for that lead. This is why it’s key to have a proper amount of leads in the front of your pipeline. You’ll want to protect yourself from certain leakage in your pipeline and make sure you win enough deals at the end of the day. This quality of the sales pipeline to actively drive your sales process is one its most important reasons for you to use it. Well, take a piece of paper or a bunch of post-its and a whiteboard. Write down your stages from left to right and assign each of your current leads to a stage. You can also add other data: size of the deal, expected closing date and sales rep working on the deal. Then, adjust as you move in time and leads through your pipeline. Keep track of stage-over-stage conversion and the average time needed per stage. Now, for the sake of trees and time, you might want to trade the pen and the paper for a good old spreadsheet. This can be a great way for you to get into the basics of sales pipeline management. We put together a template to get you started. It covers all the basics of sales pipeline management. Go nuts! Tools like Excel or Google Sheets can work fine for you as long as you’re not dealing with, let’s say, more than 10 potential customers at a time. But, as you grow bigger, the risk of losing overview and deals will do too. This is where you may want to consider using a proper CRM. Salesflare was developed to be simpler than pen and paper and more powerful than a spreadsheet. So now you know what a sales pipeline is and why you need one. Time for you to get behind the wheel and start racing. Here’s three tips to make sure you make it off the start grid in pole position. You don’t want to be driving in the dark. It’s dangerous and you have no idea where you will end up. Your pipeline’s conversion metrics are essential to keep you on the right track and will make your sales efforts scaleable. First off, the sales cycle. Your sales cycle is the time it takes for a potential buyer to become a customer. Put differently: how long does it typically take for leads to get into your pipeline and come out the other end? Whenever a prospect takes longer than usual, you might want to flush him out and focus your efforts on others. The same principle can be applied to individual stages. Second, stage-over-stage conversion. Knowing how many deals you close on average will give you an idea of how many leads you need to add to meet your objectives. As said before: you can’t control results, but you can control activities. Sales is a numbers game. Facts, figures and science is what you want to stay on top of your sales process. It is only when all salespeople are following the same definition that you can trust the pipeline. Bigger isn’t always better. A pipeline stuffed with leads may seem like a good thing, but as a startup or small business you don’t have infinite resources. You’ll want to be selective in what you spend your time and energy on. Be picky when it comes to lead qualification. 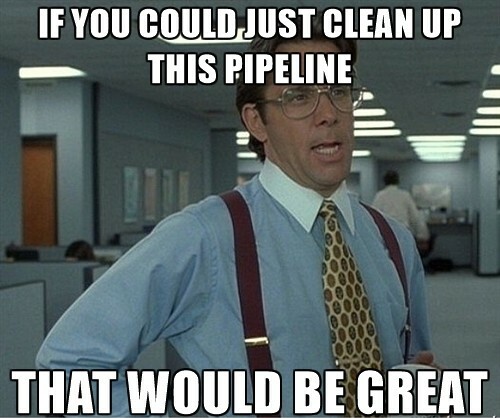 A clean pipeline begins with the quality of the leads you put in in the first place. If you don’t really believe a lead could turn into a sale, it doesn’t belong in your pipeline. You want to focus your efforts on deals you feel confident of closing within a healthy sales cycle. Do spring cleaning every one or two weeks. Check up on all the deals in your pipeline and identify the ones that hold up the pack. You don’t have to get rid of them. Instead, put them in an alternative pipeline or in the fridge, to follow up on later. Focus on deals you’re confident of closing within a healthy sales cycle. If you’re a Salesflare user you can use the hot-or-not feature to detect hot leads. Sluggish ones will show up in your insights and home screen. Your sales pipeline needs a flow and so do you. Use the Power of Habit to stay on top of your pipeline. Putting in new deals, stage-over-stage lead qualification and regular pipeline cleaning are key activities you can easily pour into a daily routine. Turning these activities into habits will ensure maximum productivity at minimum focus. Your pipeline on autopilot. And you don’t have to stop there. 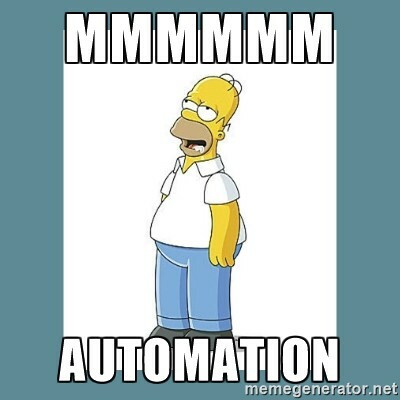 Today’s technology makes it possible to run most other, mindless tasks automatically. No more admin work. Read here how Salesflare frees you of manually inputting data and automatically logs customer interactions. Zapier can make your CRM work together with all of your other productivity tools, like Google Sheets, MailChimp, Trello and Slack. You can just focus on the art of managing human relationships and closing sales while your pipeline runs itself. A 2015 Harvard Business Review study found a direct correlation between effective sales pipeline management and strong revenue growth. Using a sales pipeline to manage your sales process is the fastest way to nail forecasts, hit quotas and see sales reps perform beyond what you imagined to be possible. No catches, you just have to set it up. You can start today.